Some incredible things can happen on the App Store. The other day I downloaded MatCube, a free game for iPhone and iPad by Eizo Ono. Nothing on the iTunes page suggested that it could be a great puzzle: I couldn't even understand the description, because it's only in Japanese, and the screenshots made it look more like a proof of concept than a full featured game. Still, I'm glad I downloaded it, because I was blown away by how clever it is. Actually, it's not even one puzzle. It's 4, or 8, or 24, depending on how you want to count them. Let me explain. The grid of 3x3 cubes is the goal position. This is the easiest difficulty setting, where each cube has only 2 colors: 2 opposing faces are red, the others are green. When you tap the Shuffle button, the cubes are randomly scrambled, and you need to get back to the goal position. The first thing that I thought when I started interacting, was "this is Lights Out on steroids". 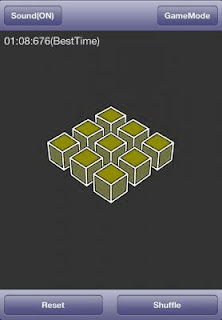 Lights Out is played on a 2D grid, and MatCube appears to be the natural extension to 3D: when you tap a cube, the cubes that surround it are rotated. Lights Out is a relatively simple puzzle, because each cell can only have 2 states: ON and OFF. MatCube is a bit more complicated because, at the easy difficulty, each cube can be in 3 states. Also, the side from which you move a cube changes its state in a different way, because the cube rotates around a different axis. Solving MatCube at this difficulty (and by "solving" I mean finding an algorithm that consistently allows you to get back to the goal position after shuffling) isn't extremely hard, but it isn't a walk in the park either. It took me several attempts to eventually "get it", though the naive method I used doesn't generalize well to the higher difficulties. When playing at the normal difficulty setting, each face of the cubes has a different color, so each cube can be in 6*4 = 24 different states. This makes things a lot more... interesting. When playing in full color mode, it's useful to know that you can rotate the cubes in the opposite direction by tapping while touching the screen with another finger. But that's not all: what I described so far is just one of the play modes available. There are a total of four different modes. The second one is similar to the first, but when you tap a cube you rotate all the cubes in the same row and column, instead of rotating only the surrounding ones. The third one is a surprise: one cube is removed from the grid, and moves are made by rolling cubes towards the hole. Therefore, this could be described as "15 puzzle on steroids". I have tracked down a mechanical puzzle using the same mechanics: Rolling Cubes by John Harris. Tapping a cube rotates all the surrounding ones, which can be up to 6, each one around a different axis. (2 colourings of the cubes) * (3 sizes of the grid) * (4 play modes) = 24 combinations. Not bad for a free app! The main criticism I have about this wonderful puzzle is that playing on an iPhone or iPod the cubes are a bit too small, and it's difficult to tap the one you are aiming at. While this is pretty much unavoidable when playing the 5x5 version, the 3x3 and 4x4 versions could be easily improved by simply making the cubes larger. A significant missing feature is that the position is not saved when the app goes to the background, which makes it impractical to attempt solving the larger puzzles unless one has a good amount of time to spare. I also don't like that the only form of score is the timer shown at the top left of the screen. Personally, I would be more interested in the number of moves. That could be improved by using different colors, or by adding other visual cues to the cube faces (for example, making them look like dice). Overall, this is certainly a puzzle that will stay on my iPod for some time. Congratulations to its inventor!